Clothes Dryer: Check if outside dryer vent flap is clogged and stuck open. Your clothes dryer tumbles your clothes in the presence of hot air. This process causes fine pieces of fabric (lint) to be produced, which travels through an exhaust vent pipe to exit your home. At the end of the vent pipe is a door flap, that automatically opens when air is coming out of your dryer, and then should close tightly when the dryer is off. As the lint starts to build up, it can prevent the door flap from closing properly, which allows cold or hot air into your home, as well as pests. NOTE: The tasks and timings shown here for your Clothes Dryer are based on a single-family home (owned), located in Massachusetts, United States, with priority set at ‘1 star' or higher, for all possible goals. If you set your personalization differently in your Home Wizard app, then you may get reminders for different tasks and timings in your recommended home care program for your Clothes Dryer. This task involves finding where your dryer's vent piping exists on the outside of your home, and then checking that the door flap on it closes tightly, and is not kept open by lint build-up. If it does not close tightly, then either scrape the lint away, or if the door has gotten damaged, then it will need to be replaced. 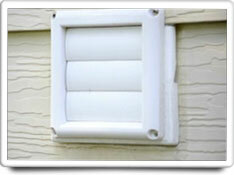 The benefits are moderate, as a stuck dryer vent flap can let in cold air all winter, and let in hot air all summer. And this will increase the energy costs for your home. The cost of doing this task is very low. It is estimated that it should only take about 30 minutes, and is relatively easy to do. No specialized tools are required.